Baume & Mercier (B&M) is aligning with the times, launching a new brand of sustainable watches dubbed BAUME. The eco-designed line looks to connect with a public increasingly concerned with the environmental impacts of the products they purchase. BAUME brought Quantis on board to provide guidance during key stages of the design process. By reimagining the way watches are made — from design conception to materials sourcing and packaging — the Swiss manufacturer of affordable luxury watches was able to create a product that sits at the cutting edge of science and sustainability. Diverging from traditional timepieces, the new unisex watches are ecodesigned, easily repairable and have a minimal environment footprint compared to conventional watches. Before embarking on the design process, BAUME tapped Quantis to perform a life cycle assessment of a classic watch to piece together a complete picture of the product’s impacts, identify hotspots, and better understand where key improvements were needed. The resulting data and subsequent analysis were then used by the company to inform the eco-design of the new watches. Quantis was later engaged to verify production methods and materials chosen by the BAUME team. An important decision was to use aluminium, 100% recycled PET plastic, and various recycled, recyclable and reused materials in lieu of the more traditional leather and precious metals. The environmental aspects of various watch batteries and automatic movement mechanisms were also analyzed. 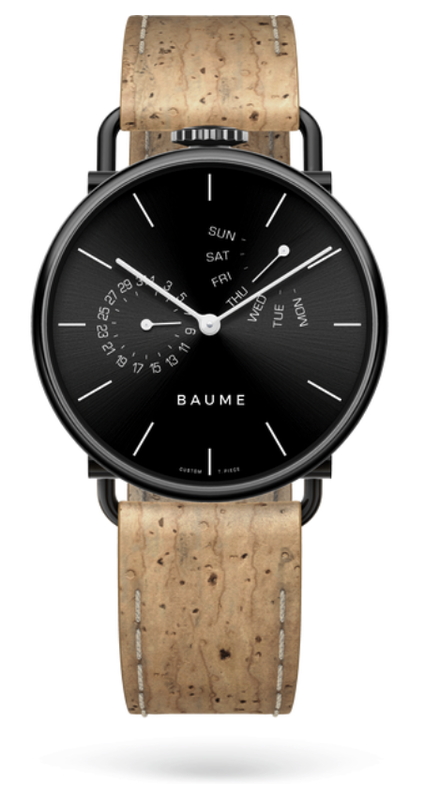 In addition to improving the sustainability performance of its watches, BAUME ensured product packaging was also optimized: Secondary packaging has effectively been eliminated and all paper and cardboard materials are Forest Stewardship Council certified. The packaging was designed in a way that encourages reuse, with the watch’s accompanying sleeve and box finding new life as a glasses case or pencil sleeve. To learn more about this project, contact Quantis Senior Sustainability Consultant Denis Bochatay.